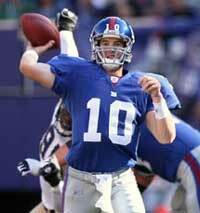 2010 NFL Football - New York Giants Preseason NFL Schedule, Super Bowl Odds & NFL 2010 Picks: The NFL football New York Giants kicked off the 2010 Preseason NFL schedule with a 31-16 NFL picks win over their neighboring New York Jets. The Giants quarterback Eli Manning suffered a blow to the head which put a 3 inch cut above his eye, Manning had to leave the game and head to the Llocker room for stitches. Eli Manning's helment was blown off by a hit after a botched play from scrimmage. In their week 2 NFL picks matchup the Giants will play hosts to the Pittsburgh Steelers and it is currently questionable on whether Eli Manning will play. The Pittsburgh Steelers head into this week 2 NFL preseason picks matchup listed as the Vegas odds favorite with the Vegas lines set to -4(-110) versus the New York Giants who have been listed by NFL football odds makers with a +4(-110) Vegas point spread. "Initially, we were all concerned and scared," stated Giants Shaun O'Hara. "When you see a quarterback bleeding like that, it was something out of a Friday The 13th movie." The Giants went on to dominate the Jets in their 31-16 NFL preseason picks win over the Jets, replacement QB Jim Sorgi made easy work of the New York Jets backup "D" with two touchdowns, 146 yards, going 8/15. Sorgi might get the start today since Eli Manning may need to give his laceration time to heal. The 2010 NFL football odds makers currently have the game total set to 36( ov-110) and many expect this NFL preseason picks matchup to go over the posted total. 2010 preseason NFL Football Predictions are kicking into full gear this week, so open your NFL Football betting account at BODOG.COM for the NFL football betting season and start building up that bankroll in time for the 2010 NFL regular season!